At the DEMO Conference today, Phreesia, the first company to offer a free patient check-in solution in the physician’s waiting room, introduces its offering. 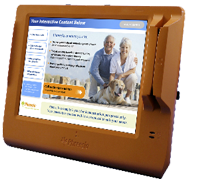 In addition to automating the check-in process, Phreesia delivers fully interactive relevant health and wellness content directly to the patient using its cutting edge wireless PhreesiaPad. Click on http://phreesia.com/demo.aspx to see how it works. Version 2.0 is available now.